Alvord is one of at least 1,350 school districts and government agencies across the nation that have turned to a controversial form of borrowing called capital appreciation bonds to finance major projects, a California Watch analysis of bond financing data in the U.S. shows. 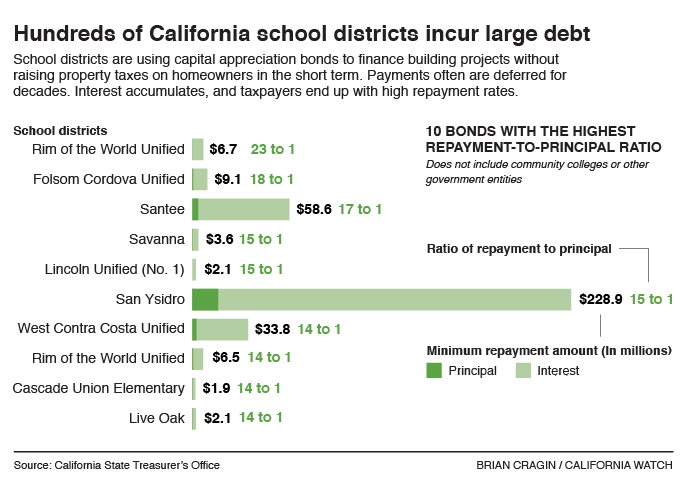 Relying on these bonds has allowed districts to borrow billions of dollars while postponing payments in some cases for decades. The issue first came to light last year after the Voice of San Diego and a Michigan blogger reported on a questionable capital appreciation bond issued by the Poway Unified School District. Some California districts, including Alvord, have used the bonds to get around a state limit on property taxes. To pay off bonds, unified school districts are allowed to tax residents no more than $60 per $100,000 of their assessed property value each year. By issuing capital appreciation bonds, districts that have reached that limit can push the tax burdens of new bonds far into the future. According to state records, Piper Jaffray was the busiest underwriter since 2007, brokering 165 capital appreciation bonds for a price of $638,045. Goldman Sachs made the most money as an underwriter during the same time period – $1.6 million on a single deal with the San Diego Unified School District. “Looking back, the Legislature’s decision to eliminate the flat debt service requirement in 2009 is what led to a lot of these highly leveraged deals,” said Scott, the financial adviser. KNN charged the district $156,000 for advising on the deals, according to state records. Advisers at KNN declined to be interviewed, but Dave Olson, a managing director for the firm, said in a statement to California Watch that, ultimately, districts set their own fiscal policies. Whether Napa’s school board understood the long-term implications when it approved the deal remains unclear. When California Watch first asked school board member Joe Schunk about the deal in November, he said Napa had not issued any capital appreciation bonds. Unlike Napa, Alvord had reached the $60 tax cap at the time it decided to issue its capital appreciation bond. Each classroom cost $10,000 to furnish with hardware and technology, including digital blackboards that likely will be obsolete when the district’s first bond payment comes due in 2026. This story appears courtesy California Watch. Reproduction is not permitted.